This year, many cities in Europe will be treated to “The World of Hans Zimmer,” a concert featuring orchestra, choir and soloists performing some of the famous composer’s greatest works for film (everything from Gladiator and Inception to The Lion King and The Dark Knight). For the program, was pleased to be asked to write an essay putting the German-born, London-trained and now L.A.-based composer’s career into perspective. It wasn’t easy — but it was fun. Around the same time, I managed to break the story about Zimmer receiving the Max Steiner Award this fall at Hollywood in Vienna; that Variety piece is here. 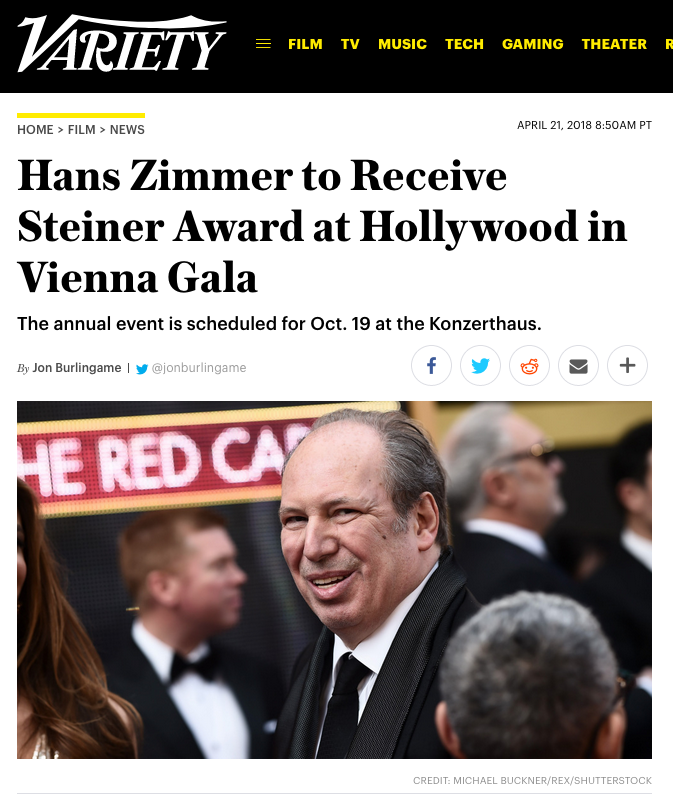 This entry was posted in Composers, Film Music, Interviews and tagged Hans Zimmer, Hollywood in Vienna, Max Steiner Award, The World of Hans Zimmer, Variety on April 21, 2018 by Jon Burlingame.